The length of the annual growing season is the period between the day when the average daily air temperature in spring exceeds the temperature threshold of 5 °C and the day when it drops below this value in autumn. Air temperature at 5 °C is generally recognised as the lower temperature threshold for plant vegetation, while the period with average air temperatures exceeding the temperature threshold denotes the length of annual cycle of vegetation. The temperature threshold so determined is used as one of the conditions for the classification of agri-ecological zones. The length of annual growing season as one of environmental change indicators, together with its changes in time and space, allows for an assessment of the impact that the changing climate has on the development of plants and their environment. This indicator can also prove helpful in the preparation of adjustment procedures for the newly arising conditions and mitigation of possible adverse effects (National Environmental Action Programme). The rise in average air temperatures and the increased frequency of days with temperatures exceeding the vegetation threshold influence the prolongation in the length of annual cycle of vegetation. The latter has a non-homogeneous character, with appreciable deviations within the period in question (i.e. 1961-2007). 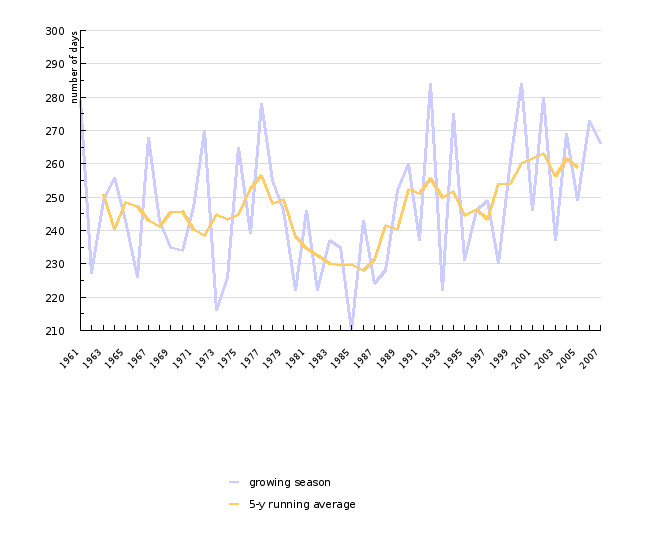 The 5-year running average indicates a slight cyclic oscillation. The last cycle of 5-year running average values indicates the prolongation in the length of annual cycle of vegetation since the 1990’s, which is also made strikingly evident by the comparison of average values for the periods 1961-1990 and 1991-2007. The adjustments to the changed length of cycle of vegetation are expressed as gradual changes in agricultural technology, which, owing to the nature of agricultural production, is a lengthy process. In introducing new technologies into agricultural practice, special account is to be taken of environmental factors, the laws of environmental protection and supporting information systems (agri-meteorological data). In accordance with the National Environmental Action Programme, reduction of the burden caused by the changing length of cycle of vegetation (introduction of new varieties) will require upgrading of existing legal and economic instruments for environmental protection (biodiversity, sustainable development), acting in line with the adopted international conventions (Framework Convention of the United Nations on Climate Change, United Nations Convention to Combat Desertification, Convention on Bilogical Diversity), strengthening supervision over sources of environmental hazards, heightening environmental awareness, enhancing the knowledge on environmental issues, and encouraging sustainable forms of agricultural production. The source of the original database is the Archive of meteorological data, Environmental Agency of the Republic of Slovenia. 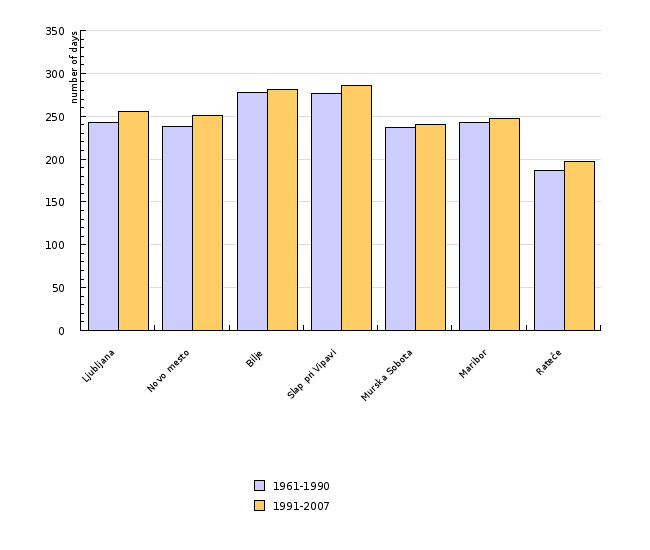 For the illustration of the length of annual growing season in Slovenia, an analysis was made of daily air temperatures at 7 meteorological stations for the period 1961-2007 (meteorological stations: Rateče, Bilje, Slap pri Vipavi, Ljubljana, Novo mesto, Maribor, Murska Sobota). Criteria for the calculation of the length annual growing season are taken from the CCL/CLIVAR (Working group on Climate change Detection, European Climate Assessment & Datasets), which labels the length of annual growing season as an indicator of climate changes No 143 (www.knmi.nl/samenw/eca). The annual growing season length presents the number of days between the first occurance of at least six censecutive days with the daily mean air temperature above 5 °C and the first occurence after July 1 of at least six consecutive days with daily mean temperature below 5 °C. In relation to the climate situation in Slovenia, the spring condition has been changed in such a way that the spring temperature threshold occurs after the last series of six or more consecutive spring days with the temperature above 5 °C, thereby excluding at least six-day long early winter warmings.